When you utter the word CRM (Customer Relationship Management) you will discover numerous entrepreneurs particularly SMEs shaking their head in contradiction. Many SMEs would state that CRM software is a costly affair for their business. Many without comprehending or understanding what CRM is and how it can change their business activities, they simply opt to neglect the utility factor of a CRM software or simply follow the pattern of actualizing it in the workstation, based on opinions heard from others. This is indeed a bad idea to conduct. One has to primarily understand the principal need of a CRM software in their workplace. One need to signify the need of business software like CRM in bringing more potential clients to business place via keeping note of the latest business trends and implementation of right strategies for customer retention and more. So how do how do you know it’s time to switch over to a CRM software rather clinging to the traditional way of conduct? Well, in each business there will few signs that demonstrate whether the time has come to utilize a CRM software at their workplace. 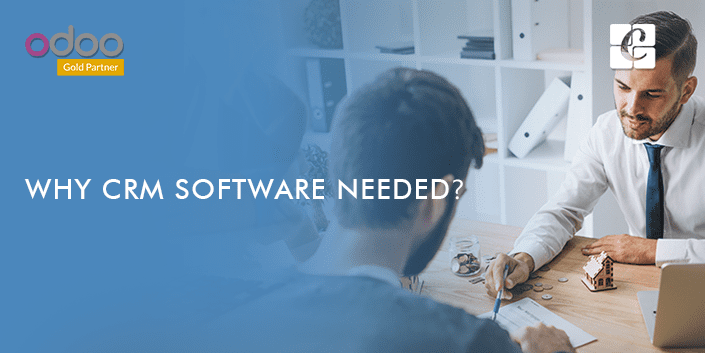 This blog will familiarize you with such issues and help you comprehend when you should go for a CRM software in your place. 1. When your Microsoft Excel limits your actions. You may adore your Microsoft Excel suite. Also, maybe, you make the best utilization of your excel spreadsheets filling information for forever. Indeed, this can turn out to be comprehensive, tedious, and dreary and can likewise influence the efficiency of your employees. If your employees discover excel sheets are no more interesting or it's exhausting, it’s time that you get switched to a CRM software. The automation offered by the business software guarantees that you or your employees don't need to feed or fetch data manually, enhancing redundant free workflow. With the implementation of a CRM software, every business hours turn out to be progressively beneficial, productive and hassle-free as it caters to automation of marketing, sales, and other client support services. 2. When your organization doesn't have a unified database for client information. Regardless of whether your business is little or in a growing mode, it is imperative for you to have data about your clients, so that you can take vital choices over it. Furthermore, you can't store everything in Excel sheets, Google drive, and books. Regardless of whether you do, your workers will have tough and intense labor discovering all the client data and exchanging between various areas and documents. Having a CRM application substituting prior can furnish you with a bird view of your client information. A unified database can give client information like contact data of customers, insights concerning the last cooperation with them, a brief on past meetings and more in one single click. It additionally empowers the salespersons of your organization to keep up an association with their potential clients through a centralized database framework. 3. When your salespersons get bewildered about a specific client. As an entrepreneur, you may have experienced examples when your sales representative forgets a past client and find it hard to retrieve client information. This is a common scenario if the business has a huge tremendous database overpowering your business staff in recollecting every one of the insights concerning a client. Subsequently, it makes a terrible impression before your clients making them feel less vital. On the off chance, if your business gets acquaint to a CRM software, it will furnish the business experts with every one of the information about clients on their fingertips. As we said in the prior paragraph, it incorporates contact data of customers, insights concerning the last cooperation with them, a brief on past meetings and more. By having a unified database, the business thus gets a platform to trigger a decent association with the clients and serve them personalized. 4. You manage every one of the clients similarly. Gone are the days when every client was managed similarly. With the approach of target marketing, the elements of client relationship have changed. You can't in any way, shape or form a similar marketing strategy or promotional content for both old and new clients. With the implementation of CRM software, the business can empower themselves to isolate their leads based on their requirements, preferences, socioeconomics and more. This helps in better communication with clients and helps in retaining them for a longer run. The business can offer regard personally to each client and prospect which incorporates sending personalized pamphlets, giving data about new offers, limits and different updates keeping in mind their needs and requirements. 5. When you witness bad coordination among sales and marketing team. It is critical for the deals and promoting group to work connected at the hip to bring great outcomes for your business. Utilizing CRM software, marketing and sales department get constant access to client profiles and information identified with them. When the marketing department discovers potential leads, it can real-time pass it to the sales team via a centralized database framework. From there on, the business group can follow up on the leads and convert them into lasting clients. A coordinated sales-marketing duo can bring in amazing things for your business. 6. When your analytics tool turn isn’t sufficient and adequate. Do you think about the progressing market patterns? Is it accurate to say that you are ready to figure client requests absolutely? Would you be able to survey your business development procedures? On the off chance that the response to the above inquiries is "No", you should have a CRM which empowers you to embrace the above procedures easily. Regardless of whether your business group isn't accomplishing its objectives on time, you can investigate it and make reports dependent on their exercises. When you have robust CRM software in place, you will have the capacity to make redone reports for your business right away. It gives you graphical and factual representations of every business actions and proceedings. Unified information got from these reports will assist you in setting focuses for the forecasted events to come. Isn't that incredible? 7. When your staff turnover is high. It is tiresome to hire new staff every now and then and offer them with training. Additionally, the higher business officials leave their position, they take along the critical data about your business alongside them which can make a huge impact on business growth. In the event, if you prefer going for a CRM software where you can store all your critical business data that will be a smart decision rather than spending huge amount of energy and cash in preparing new workers to keep information discreet. The centralized database can help your new recruits, find the right information in less effort for starting their work. What's more, we want in a business? "A fasten in time spares nine." 8. When you are losing your client. It is imperative to make the clients feel that they are vital. Furthermore, there can't be a greater misfortune for a business than losing clients to the competitors. Having a CRM software at your place, empowers you to deal with client requests proactively. It keeps all the data about your prospects, leads and loyal clients. You can likewise incorporate social media tools in CRM to get real-time feedback of clients about the product or service offered by your business. Obviously, it will assist you in improving your items and administrations. 9. When your business is growing. In the event that you have set up your business with clear goals and you are working the correct way, it is certain to grow in great heights. What's more, it is a most grounded sign for you to move to a productive and robotized framework. Introducing CRM software will make new open doors for your business. A robust, self-reliant CRM software gives your business all the fundamental apparatuses to keep up and screen distinctive business forms. Odoo CRM is a robust business application for efficiently managing business customers. It has all the features like modern user interface with efficient lead nurturing protocols, pipeline management, the customer addressing book, efficient communication channels, better reporting and analysis tools, moreover integration to other Odoo modules making it the most efficient and most sought after business application in the ERP industry. Odoo CRM works fully integrated and customizable open source business application keeping all your business data holistic. Odoo CRM significantly reduces the workload of humans and errors prone to their manual data entry. Cybrosys is an exponent in Odoo ERP and has showcased many extensive services in CRM, Manufacturing, Accounting and Purchase, Sales, Warehouse Management, E-commerce, and Website. To know more about Odoo CRM and avail our service, drop your information to info@cybrosys.com.